In this period of many changes, there were new developments also in the way in which criminals were detected and dealt with. The Montgomeryshire County Constabulary was one of the first county police forces set up in Wales. 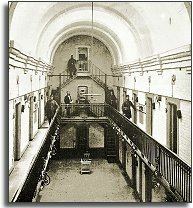 Montgomery itself was the scene of many criminal trials and the site of the County Gaol where many criminals were locked up.